Sleeping in your overstuffed bed at Timberline Lodge on Oregon’s 11,239-foot Mount Hood, you may feel like you’re the only mama on the mountain. Yes, despite your children snoring in their beds. Knotty doug fir paneling wraps you up in a cabin-like interior — and whether rain or snow falls, it’s cozy and silent inside. The interior public area at Timberline Lodge; a great place to grab a book and curl up. We recently visited Timberline Lodge for an overnight stay, and I can’t recommend it enough. 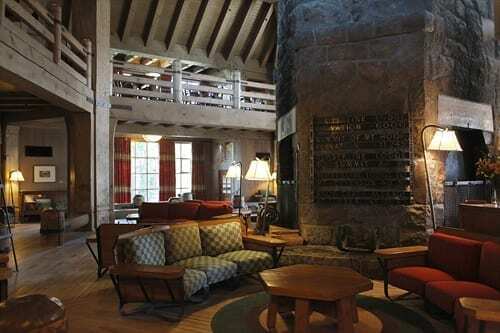 The lodge offers ski lifts right outside the door and 1930s-era history inside the somber stone walls. Built as part of a WPA project to put the unemployed back to work, the lodge’s timber frame still stands solid at 5,960 feet (right above treeline) on Hood, and is now a National Historic Landmark. Little details, handcrafted generations before — animals in stained glass, curlicued ironwork, hide-woven chairs and wooden deer, beavers and eagles carved into staircase newells — delight modern-day children. Appliquéd wagon trains roam across your bedroom curtains. You’re sleeping amidst living history. What to do at Timberline with kids? 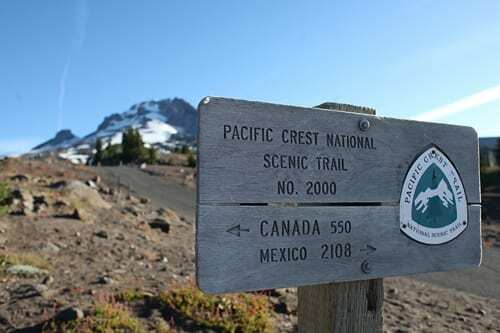 Right above the lodge, families can hike along the Pacific Crest Trail (north to Canada, south to Mexico) for an easy mile or two along wildflower-lined paths. Then take a dip in the hot tub on a chilly day, or go out at night under a starry sky. 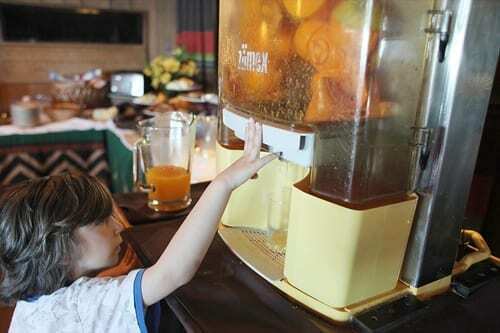 Other family-friendly features at Timberline include a movie list and DVD players in some rooms and lots of opportunities for critter-spotting: watch chipmunks gather right outside the lodge’s plate-glass windows and birds flit through the few, lonely trees. At night, bats chase moths under the moonlight. Some families may also enjoy the year-round Magic Mile Sky Ride, a chairlift that whisks you to the 7000-foot level. In winter, of course, cross-country and downhill skiing is right outside the door. In summer, visit the Mt. Hood Adventures Park at Skibowl for go-karts and other rides. In winter, Skibowl is also an affordable downhill ski destination, and just a few miles from Timberline. Where to eat at Timberline with kids? Dining options are unfortunately limited and expensive. But at times, kids eat for free in the upscale dining room in the early evening hours (when we were there, between 4:30-6:30). Ask about this at check-in; not all staff offer the info. I suggest the Paul Bunyan-themed Blue Ox Bar, where The Big Man and His Big Ox are enshrined in stained glass. For my 4-year-old son, the images spurred an immediate fascination with an old-timey superhero (When Paul Bunyan was a baby, his crawling caused earthquakes! Trees were his toothpicks!). For a winter treat, head upstairs to the amazing views at the families-welcome Ram’s Head Bar, where you can order a hot chocolate featuring Dutch-processed cocoa and English toffee bits; the whole delicious mess is topped with whipped cream. A cup easily delights (and rewires) two tired-out children. Only 70 rooms are available at Timberline Lodge, and they’re not cheap. Look for offseason deals (spring, fall), midweek peak-season stays or combo midweek winter packages, if you want to stay in a four-person suite. Prices range from $180 for a simple Queen with rollaway to $310 for a room tricked out with a fireplace. Or if you want to visit for far less, reserve one of the hotel’s “Chalet Medium” rooms, for around $125/night. Yes, you’ll share a bathroom with other guests. But I visited the four-person, bunkbed-equipped Chalet Medium room (small and tidy, with a in-room dining table) and the shared bathrooms. The bathrooms are very clean and not heavily used. In fact, the shared bathroom was bigger than our Queen-room bathroom. And besides, kids love bunking out; sleeping top bunk above the grownups is a wacky way to sleep. You’ll find more about visiting Mt. Hood in my book Northwest Kid Trips: Portland, Seattle, Victoria, Vancouver (as a daytrip from Portland). Have any other questions about Mt. Hood or Timberline? Just ask.